Former Chairman, Bank of Baroda. A Visionary and a Management Expert. 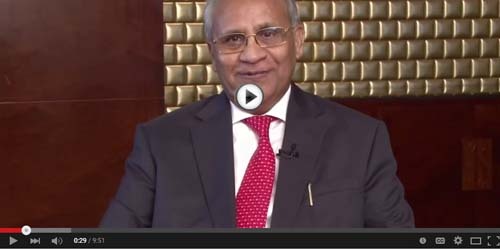 Dr. Anil K. Khandelwal is a renowned leadership and management expert, who is credited with the transformation of a large public sector bank into a global brand, during his stint as the Chairman & Managing Director of Bank of Baroda. He is the recipient of the prestigious Lifetime Achievement Award by the Asian Banker, Singapore. Recognized amongst the top 100 CEOs of India by Economic Times-for every consecutive year of his tenure at the Bank Of Baroda. Appointed to Head the committee of HR by Government of India, which is popularly known as Khandelwal Committee. He is the recipient of the Lifetime Achievement Award by National HRD Network for excellence in the field of HRD. Business of the CEO is NOT to do Business. 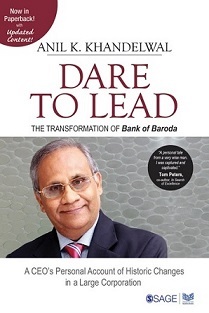 'Dare to Lead is a bestseller book, which celebrates the fascinating story of how Anil K. Khandelwal transformed Bank of Baroda (BOB) from being just another public sector bank into one of the most valuable brands in Indian banking. This is the story of the leadership challenges, management solutions and personal and professional excitement the author experienced in transforming the 97-year-old bank into a modern, tech-savvy, customer-centric bank. This book is an excellent blueprint for undertaking transformation in large, geographically dispersed public sector enterprises. It describes how a large-sized bank was transformed on all parameters with clear vision, execution discipline, customer centricity and people engagement. The author emphasizes that large-scale transformation can be undertaken successfully only if the CEO shows courage to change the status quo and mobilize the human effort within the organization. Dr. Khandelwal is the founder of Anugyan, a leadership and HR Consulting firm that mentors CEOs, budding CEOs and Entreprenuers. He strongly believes that Leadership is developed in the crucible of challenges and different experiences. His consulting practice is based on his long experience in Leadership roles as CEO, Board Member and Mentor to many. Leaders are always Present in their Absence! Manage your Intangibles;Tangibles will Follow. Business of a CEO is Not to do Business. In some way, Leaders have to be Activists. A champion for employees as well as for customers. we can never transcend to Leadership roles if we are guided by self-interest only. Irrespective of cultures, caste, colour and creed, leaders are expected to do what they say. To be fair even when you have opportunity to favour, is the real test of good leaders. If people in responsible positions speak lies- the trust and team building are the first casualties. Managers Optimise,Politicians Compromise and Leaders Harmonise. Leadership is daily practice of basic principles of integrity and respect for others. Generating and sustaining passion is the most engaging piece of leadership role. Leaders main role is to help people beat their complexes and fears. Leaders are present even in their absence. Such is their influence. Leadership is not about power and perquisites but about responsibility and accountability.